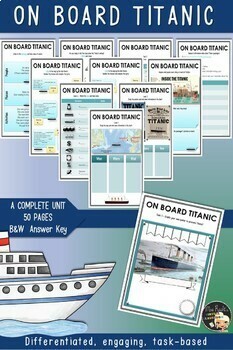 Are you looking for an engaging unit about the sinking of the Titanic! Then this complete task-based and in-depth study of the tragedy will meet all your expectations. 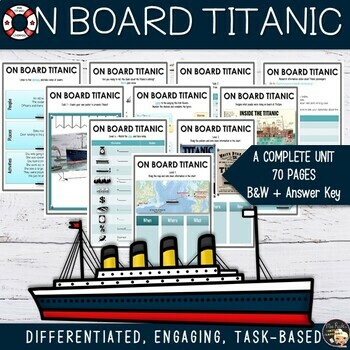 Whether your students know about the Titanic or not, whether they've watched the famous movie or not, this in-depth unit will guide them step by step from the discovery of the itinerary to the passenger's stories. They'll get engage through task-based projects (that you can adapt to your class since you receive 3 propositions for each of the three tasks included). 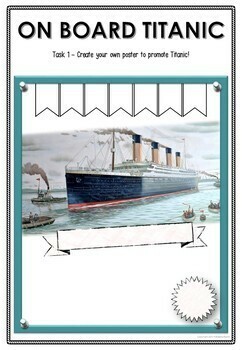 Please be aware that, although your students will watch a trailer of the movie in an activity, the unit is not about the movie but about the real story of the Titanic. Don't forget tofollow me and leave feedback! I'm always happy to read your comments and share ideas with you! Plus you can earn credits for future purchases.